Men work hard to have rippling muscles with those visible veins that simply look impressive. It is not easy to make your veins pop out because genetics have a role to play here. Moreover, your level of vascularity will also depend on the amount of water you have under your skin, your body fat percentage and how wide your blood vessels are (vasodilation). It is important to talk to your doctor before you make any serious changes to your diet or exercise program. Keep reading to learn how to make your veins pop out in a short time. How much fat you have in your body will determine how visible your veins can be. The veins that pop out are surface veins and they become prominent when there is less padding between your veins and your skin. You need to aim for keeping your body fat below 10% to make your veins pop out. Go on a diet designed to get you lean. Eat loads of vegetables and skip soda, junk food and dessert. Also, pay more attention to cardiovascular exercises. High intensity interval training, such as cycling between short yet intense rounds of speed and rest, works great. Lower your sodium intake because salt makes you retain water. Avoid processed foods since they contain plenty of sodium. Ideally, you should limit your salt intake to 1,500 mg a day. Drink plenty of water to keep your muscles hydrated. Drinking more water will also reduce water retention. You may include food with high potassium content to help your body expel water. Eating more carbohydrates will make your body hold water, so it is important to switch to a low carb diet to reduce water retention and make your veins become more prominent. You may consider trying diuretics that expel water from your body and make your veins more prominent. It is easy to buy diuretics online and offline. You can also try natural diuretics such as espresso. Keep in mind that diuretics can be dangerous when not used properly. Building muscle mass is one way to learn how to make your veins pop out. It usually involves focusing on specific muscle building strategies. You will have to use heavy weights for 3-5 repetitions. You may consider including the following two exercises in your routine to make your veins prominent. Perform this exercise to get muscular triceps. 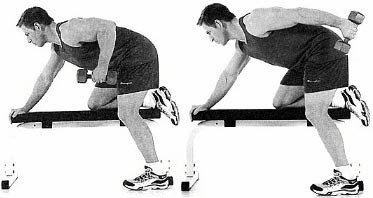 Kneel on a flat bench with your left knee placed firmly on it. Grab a dumbbell in your right hand and lift your upper right arm until it comes parallel to the floor. Extend your right arm backward and hold the peak contraction for a few seconds. Return to the normal position. Do 4 sets of 15 reps with 35 seconds of rest between sets. Get a flat bench and sit on it with a dumbbell in your right hand. 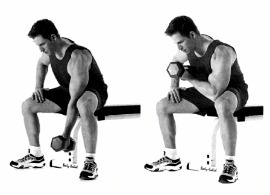 Place your elbow close to your inner right thigh and curl the dumbbell up towards your right shoulder. Do 4 sets of 15 reps with 35 seconds of rest between sets. This will help you get ripped biceps. Encouraging more blood flow to your arms is another way to achieve your goal when learning how to make your veins pop out. You can do it in a number of ways. The technique involves restricting blood flow to a muscle that in turn gives you a great pump. You have to ensure that you let your blood come to the muscle but do not let it escape the veins and arteries. You will be using 50% of your body weight that will make large fast twitch muscle fibers to work while giving your joints time to recover. Place knee wraps on the arms and make sure the wraps are tight enough to restrict blood flow but are not painfully tight. Now you know how to make your veins pop out permanently, there are some other techniques to make your veins visible for a short time. You may want to use tourniquets for this. It will add pressure in your veins and make them more visible. Placing your one hand on the right of your other hand and gripping it tight will create the same effect. The process is the same as you experience when you go to give blood. Be sure to clench and unclench your fist for a few times after securing the band. Release your grip or remove the band and your veins will slowly go back to their normal state.